Mom's Beauty Diaries – For Moms.. The most beautiful souls!! For Moms.. The most beautiful souls!! They say, your eyes are a window into your soul. Our eyes communicate so much, without having to use words. And those under-eye bags, puffy, red eyes, crows feet, etc sure convey your stress levels, lack of sleep and hydration, tiredness and fatigue. And they are the often neglected ones too. Who has time for under eye issues when there’s so much to do in life? We’ve all been there. You catch a glimpse of yourself in the mirror and see the eyes of a tired woman staring back at you…? Happens so often. But a full night of shut-eye isn’t enough to erase those stubborn dark circles. It may help diminish their appearance a bit, but to get rid of circles for good, first consider their source. Genetics, age, UV rays, scree-time (computer/laptop) and seasonal allergies are few of the reasons that give us those shadows.. If they are too severe an issue, taking advice from your medical practitioner is the best solution. They can treat the root causes with suitable medication. Now, diet and a good amount of water intake is a huge component in how our skin looks and feels; however, there are ways to positively affect the skin and create a beautiful glow and fewer wrinkles, including less visible crow’s feet, using natural remedies, including this homemade eye cream. Store bought under-eye creams can be highly expensive and chemically loaded. Its your choice on what goes into your skin. The DIY under eye cream uses ingredients which are known to be skin beneficial and super hydrating for the delicate under eye are. You could even call them SuperFoods that your parched skin needs to soak up to revitalise and brighten. The recipe uses Aloe Vera Gel which has got antiviral and antibacterial properties and the ability to help treat everything from constipation to diabetes. This translucent gel is made up of around 96% water, some organic and inorganic compounds, a type of protein which contains 18 of the 20 amino acids found in the body and lastly, vitamin A, B, C and E. You could scrape some off a plant if you have one in your garden. Secondly, the recipe uses Frankincense Essential Oil which has the ability to strengthen skin and improve its tone, elasticity, defense mechanisms against bacteria or blemishes and appearance as we age. It helps tone and lift skin, reduces the appearance of scars and acne, heals wounds and dry or cracked skin. This recipes also calls for Shea Butter and Coconut Oil. The concentration of natural vitamins and fatty acids in Shea butter makes it incredibly nourishing and moisturizing for skin. It is often used to remedy dry skin and to help protect the skin’s natural oils. Coconut Oil gets absorbed into cells and stimulates repair of blemishes and irritation. Mix the above ingredients and store in a small air tight jar. Use this mixture generously two to three times a day on a cleansed skin. Massage it well into your skin with your ring finger with circular motions. You should see positive results within a few regular applications. You can substitute Vitamin E oil with Rose water or you can add coffee oil, cacao butter, Jojoba Oil and other goodness according to what suits your skin. Ultimately, the basis of any natural skin care routine is to achieve healthy, smooth, blemish-free, translucent and resilient skin. To help achieve the best results and to avoid toxic chemicals found in most commercial products, consider making a homemade eye cream. The information above is not meant to diagnose, treat, cure, or prevent any disease. The information represents what I have chosen to do to take charge of my own personal health and that of my family. Statements on this website have not been evaluated by the Food and Drug Administration. If you are pregnant, nursing, taking medication or have a medical condition,consult your physician before using these products. Information found on this site is meant for educational and informational purposes only and to motivate you to make your own health care and dietary decisions based upon your own research and in partnership with your health care provider. It should not be relied upon to determine dietary changes, a medical diagnosis or courses of treatment. Turmeric is an ancient spice, a native of South East Asia, used from antiquity as a dye and a condiment. For hundreds of years, people around the world have linked turmeric to healing properties and cosmetic benefits. The bright, yellow-orange spice is related to the ginger root family. It is available as a ground spice or in supplements and other beauty and dermatology products. Turmeric gets its health benefits primarily because of curcumin, a bioactive component present in the turmeric root. Curcumin has anti-inflammatory and antioxidant properties. In India, our ancestors have been using turmeric for various skin problems and issues for centuries. In this particular blog post, I only want to discuss the skin benefits of turmeric and some DIY face masks using this magical spice. As stated earlier, turmeric contains antioxidants and anti-inflammatory components. These characteristics provide glow and luster to the skin. Turmeric also revives your skin by bringing out its natural glow. Healthy on the inside, glowing on the outside! The power of turmeric mixed with the natural bleaching power of lime juice will make for an effective skin lightner. And by lightener, I DO NOT mean fairer skin. It helps in the reduction of hyper-pigmentation and dark spots thus giving you skin an even tone. Pigmentation and spots can make your skin patchy and uneven. Mix one teaspoon of turmeric powder with three tablespoons of lime juice to form a thick paste. Apply evenly to the face or desired area. Wash it off after 15 minutes with cold water. You may want to try a turmeric face mask to help reduce acne and any resulting scars. The anti-inflammatory qualities can target your pores and calm the skin. Turmeric is also known to reduce scarring. This combination of uses may help your face clear up from acne breakouts. Mix a tablespoon each of yogurt and honey with a teaspoon of turmeric powder together and apply to your face. Keep the mask on for 15-20 minutes or until it dries off and then wash with cold water. Turmeric and milk have great healing properties that can help treat acne prone skin. Add 1 teaspoon of turmeric, 3 tablespoons of milk, 2 tablespoons of chickpea flour and a few drops of honey. Mix well, and apply a thin layer of this mixture on your face. Allow it to dry for 20 minutes. You can then scrub the mask off in the shower and apply your favorite moisturizer therafter. This mask also acts as an excellent exfoliator. The antioxidants in turmeric play a vital role in enhancing skin health. The spice aids in the treatment of even psoriasis. It can also cure stretch marks and other skin scars left by old injuries. However, it is suggested that it can help with eczema, alopecia, lichen planus, and other skin issues. But these require medical attention from a certified medical practitioner. 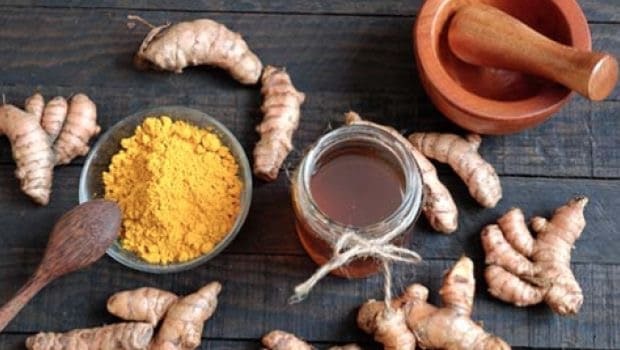 Use the below recipe for making your own turmeric infused oil which can be used for curing various skin problems like acne, scarring, spot treatment, skin rashes, redness etc. Grate a 2 inches long turmeric root into a saucepan. Add 5-6 tablespoons of extra virgin coconut/olive oil to the turmeric. Let this mixture cook on a low flame for 10-12 minutes until it comes to a boil. Once cooled, strain and store this oil in a dark bottle for further use. There are risks of using turmeric. When using turmeric, you need to be careful about the dosage, the type of product you use, and how it might react to other medications you are already taking. Turmeric has a low bioavailability. This means that your metabolism burns it off quickly and your body doesn’t absorb much. Avoid taking too much turmeric at one time and wait to see how your body reacts before taking more. If you take other medications, discuss the use of turmeric with your doctor. When applied to the skin, turmeric can temporarily stain the skin or leave a yellow residue. This is normal. But if you are allergic, direct skin contact can cause irritation, redness, and swelling. Test turmeric on your forearm, applying a dime-sized amount and waiting 24 to 48 hours to see if you react before using on your face. Do not use turmeric on your skin if you are allergic to the spice in food. We’re already mid-way through February of 2018 and on verge of seeing off the winter season. Summer is fast approaching which will come bearing heat, humidity and dry air. Here in India, where the climate is mostly hot through the year, our bodies and skins need to gear up to combat these extreme weather conditions. Summer can lend our skins to be dehyderated, tanned and undernourished. Moisterising just twice a day (mornings and evenings) may not be enough. Mid-way through your day at office or in your college when your skin has already faced grime, pollution and secretion of oil, you need a skin boost. You don’t want to go dull faced to that important meeting or lecture now, do you? Facial mists with Essential Oils are a good solution to these problems while facing the sweltering summer heat. They’re refreshing, soothing and deliver healthy benefits to your skin all the while imparting a dewy glow. They are known to deeply cleanse the skin, shrink large pores, reduce oiliness & blemishes, tighten and tone skin while giving it a lift and firmness, fight acne, even out skin complexion, freshen face, set or remove makeup, cool down a hot sweaty face, reduce inflammation and much more! They’re also pocket friendly and chemical free. One quick and generous spray of a good mist revitalises your skin, waking it up instantly while giving you the much sought after ‘I-just-stepped-out-of-the-shower‘ look. And all this from just a tiny bottle kept in your handbag while at work! But offcourse, facial mists can be expensive and some may even contain parabens and sulphates which are chemical skin irritants that are highly dangerous to our health, as per research. These chemicals are used for increasing the longevity of skincare/makeup products, for foaming as they are cheaper surfactants and for various other reasons. Continual use of these hazardous chemical laden products can also be cancerous. The DIY facial mists below give you the freedom to choose what goes onto your skin and subsequently in your body. Anyway, the recipes below are divided according to different skin types. Their shelf life is that of 3-4 days with refrigeration as they DO NOT include any preservatives and hence can turn rancid. You will need a dark, amber coloured spray bottle for storing these. Make a fresh batch after every 4-5 days. They all include essential oils, the infinite goodness of which I cannot stress enough upon. They’re just magical.. I hope the above recipes inspire you to experiment with different natural ingredients to create your own original concoctions that suit you and your family. Do drop in a comment if you tried and liked these amazing facial mists.. These hot off the oven, buttery soft, gooey, chocolatey, melt in the mouth delicacies are pieces straight from the heavens above. They’re an all time favourite in my household, all year round..
To get healthy foods into your kid’s diet on a daily basis requires a strategy and a game plan equivalent to that of multinationals’ new product launch.. It ain’t easy right? When you are competing against the junk food options advertised across all medias, it’s tough to make veggies and fruits look appetising to the smart new generation of today. Kids are bombarded with lucrative ads at every corner; be it while watching their favorite TV shows, during a trip to the nearby mall housing fast food joints or while grocery shopping at the supermarket where there are aisles filled with chips, noodles, sodas and the likes… Favourite spot for throwing tantrums too, if I may add!! Anyways, the muffin recipe below is as healthy as it can be while appealing to the taste buds of my 3 year old son. These muffins are a good option for school tiffins, as a fulfilling snack in between meals or even when they crave for sweets or chocolates. My son is very fond of them and hence we bake them often. Firstly, this recipe calls for some really ripe bananas to reach the desired sweetness. Natural fructose from the bananas reduce the requirement of extra sugar in the recipe. Whenever we’re in the mood for these particular muffins, I allow for the bananas to overripe and soften. They mash and mix well into the batter. Secondly, I use a bit sour yogurt/curd or fresh buttermilk instead of regular milk. It balances the over powering sweetness from the bananas. Thirdly, I use two variants of chocolate for this recipe; the dark compound cooking chocolate and the usual choco-chips. Also, I use cold compressed coconut oil and instead of butter. Yes, you read it right. Coconut oil is very healthy and is a staple down south of India. And if you’re apprehensive about using it, trust me when I say that you won’t even smell it in the muffins. We’ll talk about the benefits of dock oil in a later post. You can even use coconut oil specifically meant for cooking that is available in markets or online. Grease the muffin tray with ghee/clarified butter (preferably) or butter/cooking oil and sprinkle over some cocoa powder. These muffins tend to stick to the paper cupcake liners due to the melted chocolate within and hence I avoid using them. In a bowl, sift in the flour, cocoa powder, baking soda and salt through a sieve a couple of times to ensure proper amalgamation. These are your dry ingredients. In another bowl whisk in the egg/s, yogurt/curd, vanilla essence and oil. Add in the grated chocolate, the choco-chips, bananas and brown sugar. Mix well. Now add the above wet ingredients slowly to the dry ones while gently folding in the mixture. Do not over mix it as it will make the muffins too dense and chewy. We want them light and fluffy. But do check for lumps of flour. If you find the batter too thick, add a little more coconut oil or yogurt/buttermilk. Store these muffins in an air tight container under refrigeration and microwave for 20-30 seconds whenever you want to hog on them. Polish these off within 3 days of the bake. I know you won’t be able to resist! They’re the perfect partner for tea/coffee. The kids will enjoy these for sure and you’ll be working on your next batch in no time. Let me know in the comments below how u liked them and share your own muffin recipes or kids friendly ones..
I’ve struggled with acne and scarring ever since puberty, like every other teenager. Those nasty, sometimes painful pimples would take forever to subside and another million years for the marks to fade away. But off course, prescribed medication would give some relief but more so only temporarily. In adulthood, the occasional zits and pimples pay me a monthly visit during the PMSing stage; announcing the impending arrival of Auntie Flo!! Don’t most of us go through that? I’ve been dabbling into Essential Oils for quite some time now and for various purposes. They’re not to be confused with Aroma Oils. Essential oils are the purest oils derived by distillation process from plants, herbs, spices, roots, flowers, seeds etc. Direct skin contact with a pure Essential Oil is an absolute NO. However, with proper precaution, Essential oils are a treasure cove with endless benefits. Here, I’ll discuss just one such use for now with Tea Tree Essential Oil. Tea tree, also known as Melaleuca, is well-known for its powerful antiseptic properties and ability to treat wounds. Thus, the oil is known to kill many strains of bacteria, viruses and fungi, as documented in various medical studies. It is widely used in skincare and beauty products across cosmetic companies. I’ve paired the Tea Tree Essential oil with Coconut Oil and Witch Hazel. We all know the benefits of Coconut oil. Witch Hazel, on the other hand, is a medicinal plant which has strong antioxidant and astringent properties that are perfect for killing bacteria that lives within skin’s pores, stopping cellular damage that can lead to skin cancer, preventing signs of aging, and speeding up healing. Mix the above ingredients in a glass bowl with either a plastic or ceramic spoon. Never use any metal spoons or bowls with essential oils as they may react to the elements within the metal thus rendering it ineffective. Store the mixture in a small plastic container in a cool and dry place. This mixture should last you up to 3-4 days. Apply generously on affected areas of your cleansed skin 2-3 times a day, preferably post a hot shower and moisturisation. Avoid the eye area. Make a fresh batch regularly. Works on all skin types. I’ve been using this concoction for spot applying on my acne and scarred areas and have seen visible positive results within a few days of application. Always conduct a patch test before using essential oils. Let me know in the comments below about your experience with this recipe if you do give it a shot. Well, thanks for joining me! The first step for every new endeavour in life is so nerve wracking that one is tempted to keep dilly-dallying it for the longest time. I’ve been so nervous about taking this first step into the big blogging world that I kept procrastinating it endlessly. But life isn’t forever, is it? Do what you want to do and do it now! And so, here I am, trying to do what I’ve been wanting to do. I’m Manisha.. an Indian Army Officer’s wife, mommy to my 3 year old son, dog and a bunch of chickens in my backyard. This blog will chronicle my ideas, DIY’s, tutorials, tips and tricks on beauty, make-up, skincare, wellness, lifestyle, fashion, mom-life and the works.. Phew!! Once a mom, women do tend to put themselves on the back burner for their families. A woman who may have spent a good amount of time gazing at herself in the mirror, may forget to even run a brush through her hair regularly once her precious little bundle comes into her life. Happens to all of us.. And its so normal..! Imagine the boost if would give to her confidence and morale if she takes a little time out for herself. We’re all born multi-taskers, aren’t we? Apart from juggling between families and work if she does invest a bit into herself, it can do her wonders. Grooming, make-up, beauty & self-care are all just tools to give her that extra push into facing her day with rigour and gusto. This is what my blog will be about.. I look forward to you joining me on this journey as we explore together on how to make motherhood even more beautiful..! !